What kind of strategy they formed? What kind of armor? It was similar (or identical) to the type of maneuvers and equipment by the Mobile Guard and other Islamic light cavalry of the Arabic empires? Perhaps even like one Carolingian knight? By the way, Portugal and Gallicia ever employed Jinetes in their tactics? If someone had any resource books or pics about them, it would help a lot! You say truly, for I saw more bodies transfixed at these assaults than I ever saw before in all my life. We lost one whom we much regretted, Senhor Joao Lourenço da Cunha, who was struck by a dart that pierced through his plates and his coat of mail and a gambeson stuffed with silk, and his whole body, so that he fell to the ground. Is it really possible? I always thought that throwing javelins not pass through mail armour. The Jinete threw a javelin and went through a Portuguese knight with the best armor of the their time. The jinetes of the painting wear mail hauberks with bascinets, cuirasses, and plate shoulder, elbow, and knee guards. They were thus relatively heavily armored and appear to have had the advantage of their Moorish adversaries in this respect. The amount of armor protection belies the classification of the jinetes as light cavalry, but it must be remembered that, in this period, any horseman with less armor protection than a man-at-arms was considered a "light cavalryman." In addition to body armor each jinete carried a large round or Moorish-style heart-shaped shield. How can a heavy armoured horsemen could be fast, light or something else? I think they were heavy as any other Knight of mounted Men-at-arms without barding. No test of javelin exist. in theory javelin got much more energy than arrows. In Jinetes times mail armour was light. The article mentions that besides throwing their javelins the jinetes also used them like spears for thrusting with one or two arms. Although Oman attributes the death to a thrown javelin, the text in Froissart allegedly says that the knight was "struck" by a javelin. I would not be surprised if it was used like a spear, rather than thrown, to achieve this result. In regards to them being heavily armoured, the article notes that jinetes were light cavalry in comparison to the men-at-arms, rather than being "light" in an absolute sense (i.e. wearing little to no armour). From what I can tell of the description, the jinetes shown in the image have only mail protecting most of their arms, and aside from the extra knee protection, they seem to have only worn mail to cover their legs. Compared to men-at-arms, who, in circa 1431 when the painting was completed, would have worn full plate armour, the jinetes are more lightly armoured cavalry. Bem Cavalgar Dom Duarte - 1438 also covers the topic of throwing javelins while mounted. The writer states that a javelin thrown from a horse at speed would have a range 1/3 further than one thrown on foot. If the other mounted person is moving towards the javelin thrower than it might just be enough to make a javelin penetrate armor. Light Mail? Like a Mail Shirt? After all, I tend to believe that an arrow would have much more power than a javelin thrown, even though you have less mass. They had some Lanza Gineta, something between a Javelin and a Lance. I never saw a cavalry charge with two handed lance except for some illustrations of Roman cavalry, but I'm not saying it isn't true, just exotic. Just limbs mail protection or full mail armour? In any way they were faster than the cavalry of his time, like an armoured knight without a barding? Interesting but, Dom Duarte, the king of Portugal? regular mail provide lighter hardness/protection than plate in this period. arrow can be 100 - 150 Joules max javelin 300-400 Joules max. Hum, did the mail changed so much over that time? What are the diferences? Riveted Chainmail surpassing Butted Chainmail? Hum, did the mail changed so much over that time? What are the differences? Riveted Chainmail surpassing Butted Chainmail? Butted mail was never used for field, only foe some decorative mail or decorative mail edges made of brass. And mail was always made in many variant thicknesses and ring sizes, so it's impossible to say if someone in 15th century had lighter or heavier mail than someone in 11th century. Yes the king of Portugal. You can probably read it in Portuguese here. Butted mail was never used for field, only foe some decorative mail or decorative mail edges made of brass. So, even in Roman and High Middle Ages warrior wore riveted mail? Why Butted was something decorative rather than practical? Yes, all european cultures who used mail used either all riveted or half riveted half solid mail. Butted mail is too easy to break through unless it's double folded like Japanese mail. Keep in mind that light cavalry is also defined by the way the cavalry is used, and not just the speed of the cavalry. 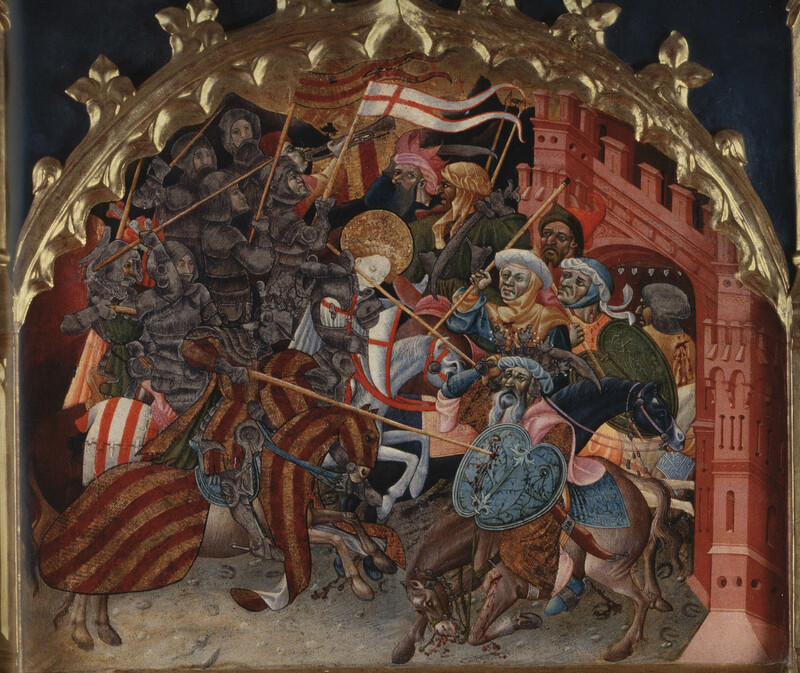 If you are mounted on horseback with a group of other knights, men-at-arms, or soldiers and you are using couched lances (held under the arm) to make charges at your opponent, and then fighting in the midst of the battle with swords and other weapons once your lances break, you are playing a role as "heavy cavalry", regardless of how much armour you are wearing. Likewise, if you are with a group of soldiers but your role is to skirmish, harass, attack and make feigned retreats, and so forth, you are acting more in a role of light cavalry. So, while the armour you wear is certainly a consideration in determining whether you are light and heavy cavalry, the main role you play in a melee is also a factor. Are you going to be charging headlong into the fray and fighting in the midst of lots of other soldiers? You're probably playing a heavy cavalry role. Are you trying to avoid getting caught in the center of a fray and basically playing a guerrilla-warfare role on horseback? In that case, you're probably light cavalry. The Jinetes are covered in Arnold Blumberg's article in Medieval Warfare III-1. From what I know, rather than javelins, they used "dardos", or feathered javelins. When there is detail, the point shown is like a "swallow-tail" arrow's, but perhaps bigger, so against unarmoured people (the most common) would be murderous. Such darts are sometimes shown in paintings from other parts of Europe too. I'm reviving the topic because I learned so much information that I would like to further the discussion in more dense topics. The article mentions that besides throwing their javelins the jinetes also used them like spears for thrusting with one or two arms. Although Oman attributes the death to a thrown javelin, the text in Froissart allegedly says that the knight was "struck" by a javelin. I would not be surprised if it was used like a spear, rather than thrown, to achieve this result..
We might have a problem here: jinetes were obliged to equip themselves with both the calvary lance and the javelins, which were feathers - like an arrow - to increase its effectiveness (Frisian javelins apparently were in the same fashion). The cavalry lance, which the article calls "Lanza Gineta" could be used either to hurl or to charge with, so perhaps when Froissart says the knight was struck with the javelin (I don't if he's specifically talking about the assengay or the lanza itself) he could be referring to the lance when he described a fully armoured knight being killed with it (sincerely, I can't accept the fact that a thrown javelin or lance could punch thourgh late 14th-century full harness). According to Heath, the heavy lance used in England, France, and Italy didn't get popular in Spain; apparently, they were the rule only in the nucleus of Spanish permanent cavalry, the Royal Guards. From what I can tell of the description, the jinetes shown in the image have only mail protecting most of their arms, and aside from the extra knee protection, they seem to have only worn mail to cover their legs. 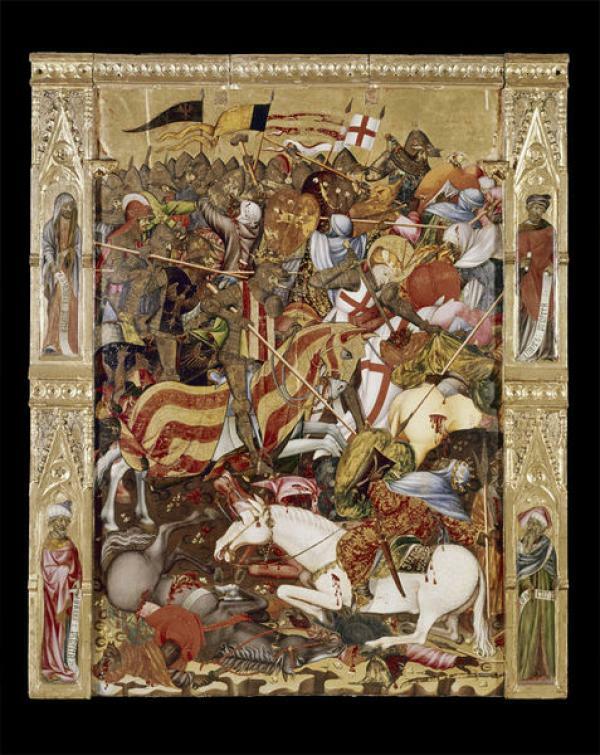 Compared to men-at-arms, who, in circa 1431 when the painting was completed, would have worn full plate armour, the jinetes are more lightly armoured cavalry. My problem with this painting is basically because it isn't the original, the one made in late 16th century using the original as a reference. That's why the men-at-arms, the military clothing, and the helmets are all 16th-century ones; the painter didn't seen to know a thing of javelins either: in the painting, there aren't different from normal spear being thrown. I'm not inclined to give credibility to the amount of armor being worn given the anachronism. On the other hand, it's worth noting that many "light" cavalry types in the 16th century wore as much or more armour. The original reiters had half-armour that protected their entire upper body down to the upper thighs (including the arms). French mounted "archers" and chevaux-legeres had roughly the same amount of protection, sometimes more (three-quarters armour going down to the thighs). An Olympic athlete will throw a 0.8 kg javelin at 28-30 m/s. That is approximately 313-360 Joules, but that is the best possible outcome with a light weight spear. I'll guess an average person will throw a 1.5 kg javelin at around 10-13 m/s (note: that's a guess.) If this is increased by 1/3 in length while mounted and moving forward, as someone here said, it's maybe the speed is 13-16 m/s. If the charging knight moves toward you at 20-25 mph, that is 8.9-11.1 m/s in addition to the speed of the javelin. An elite soldier from the Catalan Company will probably throw a javelin on foot like a modern day athlete. So that's probably 20 m/s for a 1.5 kg spear. The distance will reduce the speed somewhat, so around 400-500 Joules is plausible and enough to go through plate armour of low carbon steel and the mail and padding underneath, in theory. That is in fact an extremely high number and to be frank, unbelievable. For more info on projectiles against a target moving towards you, I suggest this link. "... [T]he officers and the light horsemen [were] known as ginetes or genitors, after their characteristic heart-shaped Moorish leather-covered shields. 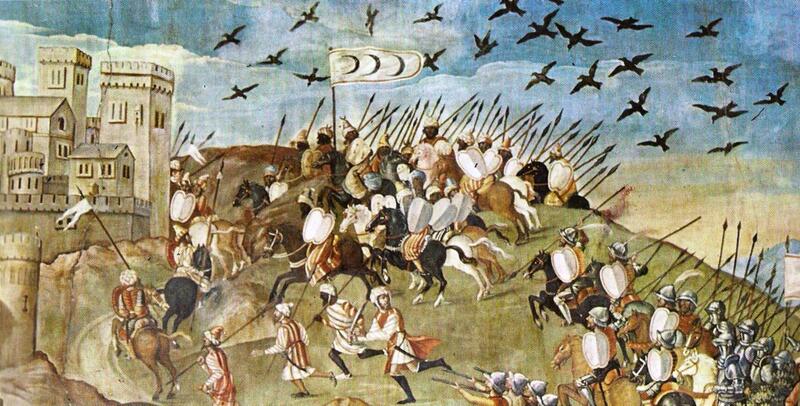 Their main weapons were swords and javelins, but some also carried crossbows. Some had plate armour, but most used mail shirts or brigantines (armour consisting of small plates fastened to the inside of a fabric covering), a steel cap (morion -- type of Spanish kettle-hat) and some leg and arm protection. Officers wore three-quarter armour and open helmets. Their horses were unprotected." The text is apparently from Cavalry:The History of a Fighting Elite 650 BC-AD 1914 . Unfortunately, the book does not give me a lot of confidence that it is working from primary sources.It also does not specify what time period this armour belongs to. Nevertheless, there might be more information available in the book's index. Por la Ordenanza de 1503 [publicada por Quatrefages en "La revolución militar moderna"] vemos que el jinete ha de portar "coraza, capacete, babera, quijotes, faldas, guarnición de brazos entera, lanza, adarga, espada y puñal o daga". En todo caso, lo más probable es que el soldado portara habitualmente una camisa de malla de cota antes que una coraza con faldas y quijotes y de ahí la sempiterna necesidad de la adarga de cuero. "En 1503, constituían las Guardias de Castilla 998 hombres de armas y 1843 ginetes ." Translation: "In 1503 the Old Guards of Castille constituted itself of 998 men-at-arms and 1843 jinetes". It was made in 1514, apparently describing a number of maa's, jinetes and harquebusiers persecuting moorish soldiers. Their equipment is clearly different from those horsemen behind them, but they're still quite armoured. That is in fact an extremely high number and to be frank, unbelievable. For more info on projectiles against a target moving towards you, I suggest this link. Doesn't inspire much confidence of me too. The jinetes never used crossbows, although, by early 16th century, El Gran Capitan employed small numbers of mounted crossbowmen or cavalry crossbowmen in the Italian Wars, those were considered a different military class as far as I know.